Submitted by Alexander Briones on Feb. 22, 2018. With so many low quality mics in the entry-level market, getting a good one can be quite daunting. To help you out, we present you with the highest rated microphones that you can buy for under $50. To cater to different needs, we divided the list into two sections - XLR & USB, with XLR being popular for live sound and USB being ideal for home recording. The XLR cable is the standard connection used for connecting with mixing consoles and PA systems. As such, these mics are ideal for live performances, but they can also be used in recording when connected to recording consoles or audio interfaces. 89 out of 100. Incorporating 3200+ ratings and reviews. The Behringer Ultravoice XM8500 is a handheld vocal mic that's meant to handle the rigors of the road. There's nothing fancy about it in terms of features, but it continues to be popular because of its quality to cost ratio. Being a dynamic mic, it can handle live vocals really well, especially with its frequency response of 50Hz to 15kHz that has a slight emphasis on the midrange which many vocalists prefer. And thanks to its cardioid polar pattern and two-stage internal pop filter, the XM8500 can handle loud rock style vocals, and even loud sound sources like guitar amplifiers. Value for money and dependability are two of the Behringer Ultravoice XM8500's most commended qualities. It is reported to work well in various settings, from small venue sound reinforcement to home recording. And while it is mostly employed for vocals, there are many who are just as impressed with how it works with amplified instruments. There are some who complained about the lack of on-off switch, but on the other hand, there are sound technicians who are thankful that it doesn't have a switch (this prevents the mic from being accidentally turned off during performance). There are a few who wanted more bass response from the mic, but noted that they were able to get them with some EQ adjustments. With its good balance of quality, reliability and value for money, the Behringer XM8500 is highly recommended. There is no denying Shure's reputation when it comes to quality microphones, thankfully they are well represented in the entry-level market via the PGA48. First thing you'll notice about this mic is its premium look, with its black metallic finish and classic silver ball grille. But it's not just about looks because it sports a dynamic transducer with cardioid polar pattern, a combination that helped establish Shure's popular microphones. Other features of this mic include a frequency response of 70Hz-15kHz and an on/off switch. Market response to the Shure PGA48-XLR is overwhelmingly positive, with many commending it for its overall sound and build quality. Those who expect it to feel cheap are surprised by how solid the mic is. And the same can be said about its sound quality, impressing public speakers, event organizers, singers, musicians, sound technicians and even DJs. There are a few who notice lack of bass response from the PGA48, especially when comparing it to its more expensive sibling, the venerable Shure SM58. Still most of them allude that for the price, the PGA48 is quite good. There are some who report that the on/off switch feels flimsy, and caution that it should be used with care. If you're looking for a budget mic with on/off switch and Shure's brand of reliability and quality, then check out the Shure PGA48-XLR. 89 out of 100. Incorporating 1350+ ratings and reviews. 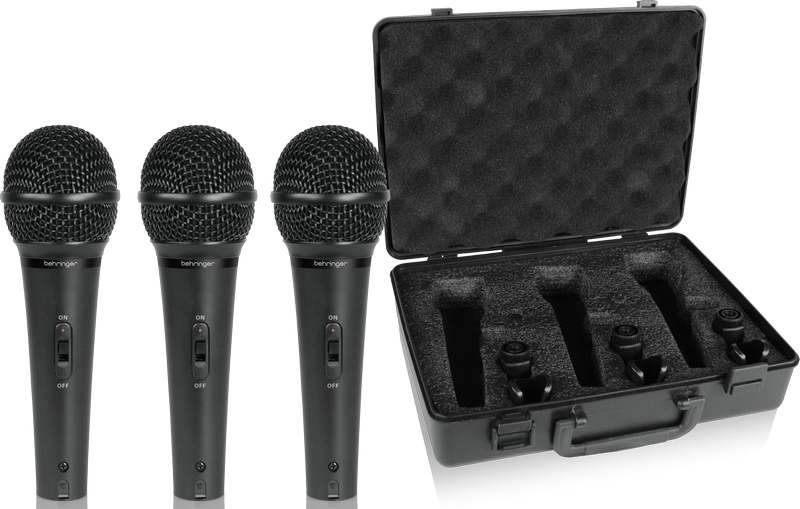 The Behringer Ultravoice XM1800S gives you a super-affordable and convenient way of adding three mics to your setup. But it's not just about saving on cost because this bundle features three XM1800S dynamic transducer microphones with super-cardioid polar pattern, a configuration that's popular for vocal mics because of its ability to reject background noise. And for the price, the mics also have surprisingly decent features which include integrated pop filters, an on/off switch and a frequency response of 80Hz to 15kHz. Finally, this bundle comes with a mic stand adapters and a nifty impact-resistant carrying case for easy transport and storage. The Behringer XM1800S leads this list in terms of bang per buck by a big margin, so it's not surprising to find that many are pleased with how much they got for the money. But it doesn't end with just that because reviews are replete with positive remarks on the mic's build and sound quality. Thanks to its wide market reach, this bundle has been successfully used at various venues and situations, including home karaoke, small stages, places of worship, coffee shops and more. There are some who cautioned that the included carrying case is not as solid as they want it to be. Sound quality also came up short for those who compare them to more expensive mics, but this should be expected given the big price difference. Add more mics without having to spend much money with the Behringer Ultravoice XM1800S. 91 out of 100. Incorporating 700+ ratings and reviews. It's interesting how cheap the Shure SM48 is, especially when considering that it is part of Shure's mid-tier SM series. It gives you improved frequency response (55Hz-14kHz), stricter polar pattern, and better transients - while having less handling noise compared to most entry level mics. More importantly, it gives you all this while retaining an entry-level tier price tag. Since this handheld mic is designed for vocals, the midrange is subtly emphasized, with some bass roll-off to reduce its proximity effect. To reduce unwanted noise, this mic comes with built-in pop filter and shockmount. In addition, the SM48 has the same rugged durability as other SM series mic. Good, great and solid are just a few of the many positive adjectives that are used to describe the Shure SM48. Some even report that they find it hard to hear the difference between it and the iconic yet more expensive SM58. It is mostly used for vocal work, with many commending its clear and crisp sound, but there are some who get equally good results miking instruments. There are a few who recommend to save up for the SM58, because they feel that the quality difference justifies the extra cost. But most are already happy with the SM48's sound quality. This affordable alternative to the SM58 gets an easy thumbs up. USB microphones allow for direct connection to your computer and other smart devices. They are convenient for quick capturing of musical ideas, and basic recording of vocals and instruments. Normally, you have to pay top dollar for a condenser mic that plugs directly to USB, but not with the Fifine K669. It is a true USB condenser mic that you can get cheap, with essential features that make it viable for those who are looking to start their journey towards home recording. 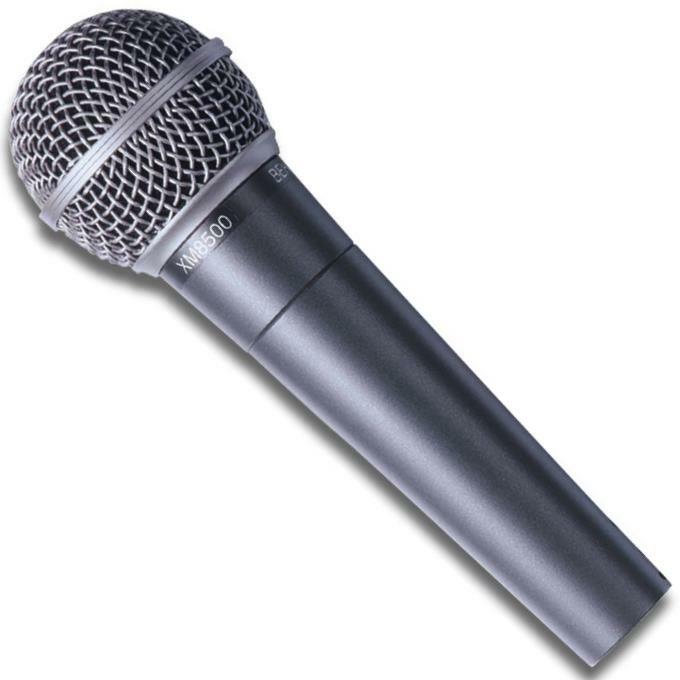 The mic's profile follows popular condenser mic shape, and has a metal exterior for improved structure strength. Other features include cardioid polar pattern, and a built-in volume control knob that's conveniently located up front. Many of the positive comments describe the Fifine K669 as a great mic for podcasting, voice-over work and voice chat. But musicians and singers are just as impressed with its headroom and clarity. Another well liked feature of the Fifine K669 is its solid build. There are a few who are not happy with the included tripod base, which feel flimsy compared to the mic. Some also recommend to properly position the mic to reduce unwanted noise. 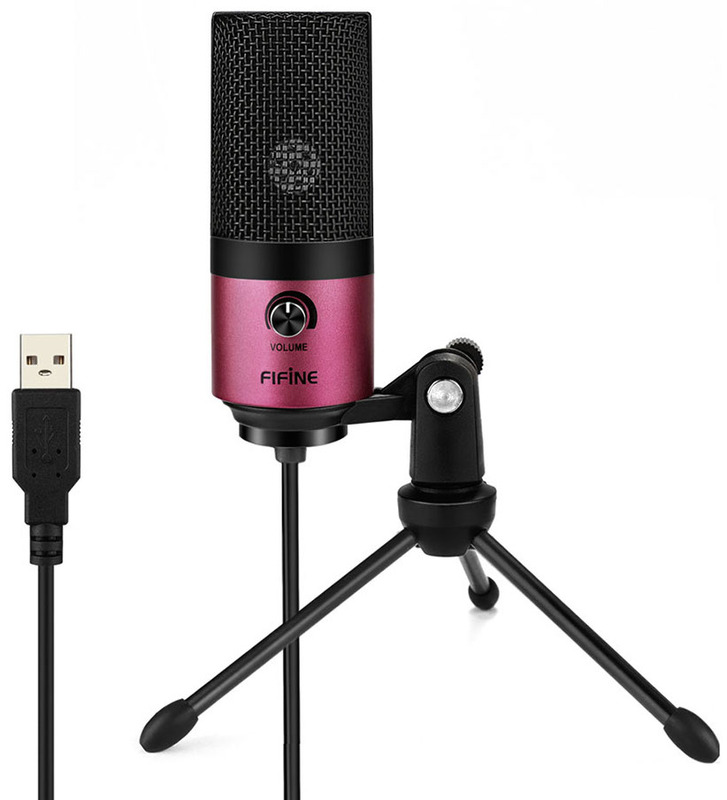 The Fifine K669 will make a great first USB condenser mic for beginners who are on a budget. 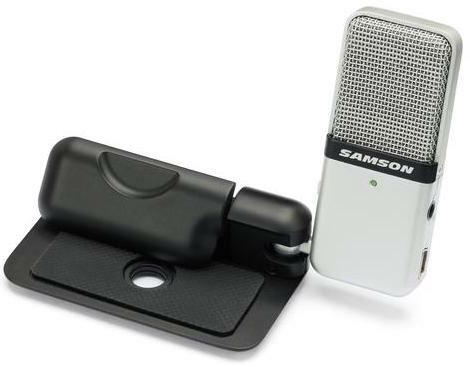 The Samson Go Mic is designed to handle situations where portable and convenient recording are needed. It is a condenser mic with a switchable polar pattern, packed into a compact form factor that can clip to a laptop and other surfaces, or sit on a desk. It is meant for voice recording, podcasting, voice chat, and more importantly for recording vocals and instruments. The ability to switch between cardioid (for close mic recording) and omni-directional (for recording multiple instruments or an entire room) makes it a very versatile tool for recording. Finally, it has a flat frequency response of 20Hz-18kHz, and comes with a nifty 1/8" headphone output so you can monitor your input with no latency. Professionals that depend on creativity appreciate the Samson Go Mic's balance of portability and sound quality. The list of satisfied users include songwriters, musicians, public speakers, YouTube content makers and many more. Reliability also came up a number of times as one of its stand out traits, which is important if you want to capture ideas quickly. The mic's clarity and ability to capture minute details also impressed many users. Ironically, some feel that the mic captures too much detail for their liking, specifically background noise. There were a few who cautioned that care is needed when handling the attachment clip. If you want to have a compact and versatile USB mic with good sound quality then do check out the Samson Go Mic. 84 out of 100. Incorporating 325+ ratings and reviews. 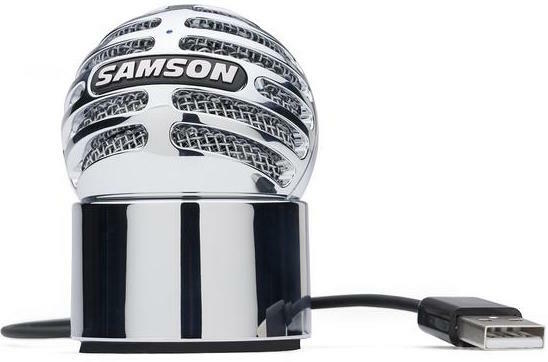 The Meteorite is Samson's take on the ball shape desktop microphone trend, the main difference being its removable magnetic base which helps secure the mic for easier positioning. This compact ball houses a 14mm diaphragm USB condenser microphone, with a frequency response of 20Hz–20kHz and sample rate of 16-bit, 44.1/48kHz - ideal for capturing the human voice and musical instruments. It has a cardioid pickup pattern which is a bit wide, which means that sound coming from the sides of the mic also captured. One user summarizes market reception nicely by saying that the Samson Meteorite Mic offers great quality in a small package. The way it sits securely on desks also endeared it to many. Easy plug-and-play setup and compatibility with different programs including music production software also get a lot of commendation. There are a few users who are not happy with background noise issues. While others found the mic a little too small for their taste. If you're looking for a convenient and compact condenser mic with more positioning stability, then check out the Samson Meteorite Desktop Condenser USB microphone. 88 out of 100. Incorporating 3750+ ratings and reviews. 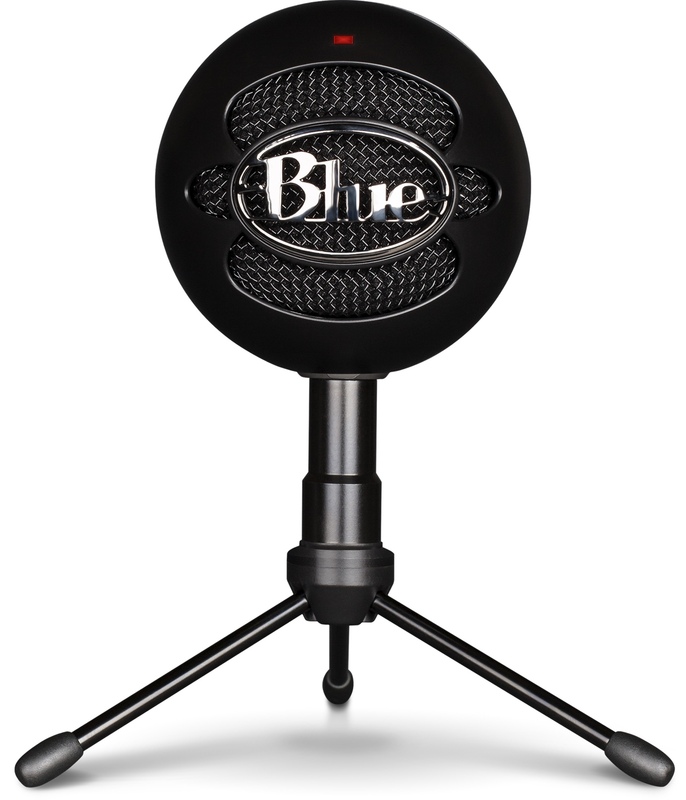 The Blue Snowball iCE is a desktop microphone with a distinct looking ball like profile. It is meant to be as easy to use as a generic computer mic, but with improved frequency response (40Hz to 18kHz) and sample rate (44.1 kHz/16 bit), which ups the quality by a good margin compared to built-in / generic computer mics. It has a condenser transducer with cardioid polar pattern which quiets down some of the background noise, ideal for vocal recordings but can also be used with instruments when properly positioned. Finally, it comes in a compact ball shape which is reasonably portable, allowing for mobile recording when needed. Overall market sentiment towards the Blue Snowball iCE is positive, with many praising the mic for its straightforward functionality, portability and sound quality. A lot of users also love the ball like shape, and its durability. It is mostly used for voice chat, podcasting and the like, but many vocalists and instrumentalists have taken a liking to it as well. There are some users who find that the sound was a bit thin, but this maybe due to proximity/positioning issues. Speaking of positioning, some users recommend trying the mic in different positions on your table (closer to the sound source) to get better results. Here is another reasonably portable and good quality USB condenser mic for those who prefer a different look. Here are some tips that can help you in picking the mic that will work best for you. If you're looking for more information, you can checkout our article that explains The Different Types Of Mics And Their Uses. In the sub $50 price range, the most popular mics are those with either a Dynamic or Condenser transducer. Dynamic mics are popularly used in live performance, because of their intrinsically higher SPL (Sound Pressure Level) handling, and reliability. They also tend to color the sound in ways that many vocalists prefer. On the other hand, Condenser mics are mostly used in recording, because of their increased sound sensitivity. The downside of this increased sensitivity is being prone to clipping (sound breaking up when top loud) and background noise. Most of the mics in this list come with cardioid or super cardioid polar patterns, which is not surprising, given that these mics are meant for front vocal use. There are some mics that offer switchable polar patterns, specifically the option to switch to omni-direction pattern, which allows for a wider reception area - ideal for capturing multiple singers, instruments and other sound sources. We've divided our recommended list into XLR and USB mics to help you know which ones are the best in their category. XLR is the standard connection used for live performances, while USB mics allow for direct recording to your computer without the need for an audio interface or recording console. When setting up your mic, it is best to try different positions to find the one with best results. This is a big topic on its own so we'll focus on a few tips that are essential for those who are just starting out. When using handheld mics, the most common position to mike vocals is around 3" from the mouth, but this will vary depending on the style of the singer. Condenser mics are a bit more sensitive so they don't require singers to preform as close. Room acoustics also play an important role if you want quiet and professional sounding recordings. Since there are many different microphones in the sub $50 price range, we decided to stick to those that work well for music - be it for the human voice or for guitars and other instruments. We ended up looking at over 15 mics, along with their relevant reviews, ratings and recommendations which summed up to over 15,600 data sources. Submitted by joe (not verified) on Jul. 19, 2018. "...this bundle has been successfully use at..."
Who proofreads these articles? Buckwheat? cmon folks. Submitted by Jason Horton on Jul. 20, 2018. Thank you for pointing that out - it's fixed now thanks to you. I'm the Editor responsible for that typo being published - please let us know if you find any similar mistakes. Submitted by Cmon Joe (not verified) on Aug. 23, 2018. I guess "cmon" is perfectly OK to write. Submitted by Jason Horton on Aug. 23, 2018.